Water resource management is a critical issue in our society due to increasing pressure on global water supplies from shifts in climate and growing human populations. Resolving the complex water resource challenges of the present and future requires sound science to navigate the intricate links between humans, the planet's climate, and water. Gradient scientists have a deep understanding of these linkages, and have provided technical analyses on a broad range of water resource topics including modeling of groundwater and surface water systems, impact assessments, and litigation related to resource development. Gradient provided expert evaluation and testimony in a water rights case filed in the Supreme Court of the United States. We used available data and various modeling and data analysis methods to estimate consumptive water use and the associated impacts on stream flows with a focus on drought periods under various scenarios and conditions. 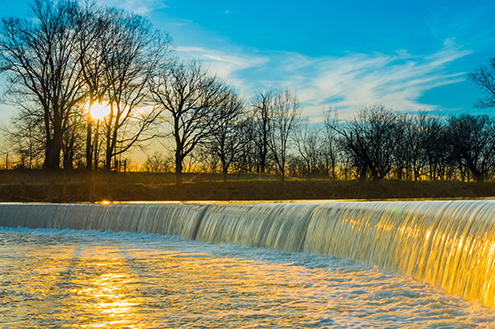 Gradient provided expert evaluation and testimony in a water rights case filed in the United States Federal Court against a water utility by a neighboring state. We assessed regional aquifer behavior based on prior studies by others and developed a 3-layer numerical model of a 10,000 square mile area. Gradient conducted a detailed hydrogeologic study and prepared a groundwater withdrawal permit application required by the State for water withdrawals from a bedrock aquifer. Gradient evaluated the potential for saltwater intrusion into an irrigation well on Cape Cod, MA. Site-specific groundwater data and theoretical calculations were used to evaluate whether saltwater intrusion should have been expected at a well given it's target pumping rate and duration. Gradient used numerical models to evaluate groundwater impacts from unlined coal ash surface impoundments under different facility closure scenarios and groundwater conditions. The results were used by utilities to support the development of closure plans in accordance with the Federal Coal Combustion Residual (CCR) rule. Gradient conducted a water quality investigation to examine nutrient inputs and cyanotoxin levels in a freshwater lake. We conducted a review of historical surface water quality information, coordinated the collection of field data, and subsequently characterized nutrient conditions contributing to periodic algal blooms.